Not to be confused with the 2006 Dr Who spinoff, this Torchwood came years earlier, introduced in 2002's Split Infinity but the origins of the character go further back than that. I played The Doctor in a comedy play performed at an annual party and was due to reprise the role the following year. Unable to make it due to professional acting commitments I made a spoof Doctor Who video recreating my Doctor in action figure form. The video can be seen here. It was posted along with episode two of The Changing of Bracchis the story in April 2003. Torchwood's fate was mapped out long before his first appearance on the AFT. This story was intended to flesh out this character and to make him more likeable if flawed. It was also intended to add flesh to the back story of The Changing of Bracchis where in part one we only hear about Torchwood and conclude that he's a bumbling time meddler. The Diary and the second part of Bracchis dispel that, cementing the character as a loveable friend of the Doctors. His next appearance would be in The Dalek Invasion of Time, the last part of this particular Torchwood arc. This story was filmed back to back with The Changing of Bracchis. The purpose of the story had always been clear- Torchwood discovers more about the Doctor, begins to explore time and has similar adventures to the Doctor. Along the way he finds the Doctor's diary giving him a far greater insight into the mind of the man he is following. In the original draft Torchwood's encounter with the TARDIS was to have come during the 5th Doctor debut Castrovalva: The TARDIS is hurtling backwards to the Big Bang and the Doctor is forced to jettisen part of the TARDIS. Torchwood is following the TARDIS and is almost hit by the TARDIS remnants. Among the debris Torchwood finds the Doctor's diary. This was felt far too convoluted and rooted in continuity that readers might not be readily aware of so an alternative had to be found. 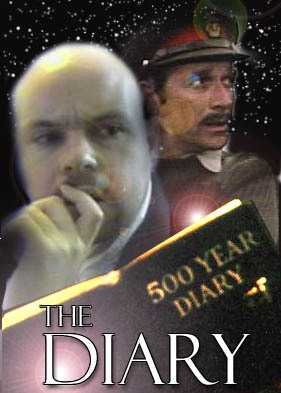 The Doctor’s 500 year diary was first seen in Power of the Daleks and throughout the second Doctor’s era. 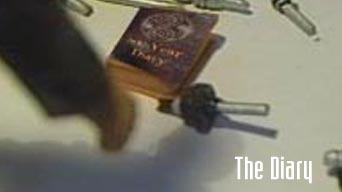 By the TV movie, the Doctor has a 1000 year diary instead. Among the items strewn on the TARDIS floor you will notice the TARDIS tool kit first seen in Earthshock and recreated for The TV Movie. This story, as a spin off, follows Torchwood's personal history, picking up from his first appearance in Split Infinity as he discovers more about the Doctor and threading through other AFT stories, War of the Cybermen and The Harvest of Death where he has been seen in the background. If you haven't read it yet, now go and read The Changing of Bracchis.